The flow of bilateral Mexico-USA trade has increased six-fold in value in the past 20 years to nearly 1.5 billion dollars a day; 80% of it moves by truck or rail. A new rail bridge, the West Rail Bypass International Bridge (WBR), opened in late August, capable of carrying up to 24 million metric tons of freight a year, which should help reduce delays in trans-border trade. The WBR links Matamoros (Tamaulipas) to Brownsville (Texas). It took four years to build and is the first new rail link between Mexico and the USA for more than a century. The bridge can be used by 14 trains a day and replaces a rail line that previously wound its way, with frequent delays, through a heavily congested urban area. In an unrelated effort to speed up trans-border shipments, Mexican and U.S. officials are testing a single, joint customs inspection procedure that could cut border-crossing times for freight by up to 80%. San Jerónimo in Chihuahua (for computers and other electronic exports from Mexico). Assuming the six month pilot project is successful, costly border delays for some trans-border shipments could soon be a thing of the past. The project has been warmly welcomed by AmCham, the American Chamber of Commerce in Mexico, which represents more than 1,400 companies. 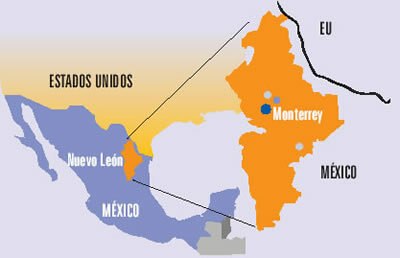 The northern state of Nuevo León is an industrial powerhouse, centered on Monterrey, Mexico’s third-largest city. The state’s shape on a map is unusual in more ways than one. The state has a long north-south axis and is very narrow from west to east. The strange indentation south of Monterrey is largely determined by relief. The peaks of the mountains on the Nuevo León side of that state boundary comprise a National Park, the Parque Nacional Cumbres de Monterrey. Perhaps the strangest aspect of the shape of Nuevo León is the peculiar extension that forms the state’s north-eastern extremity (see map above). This small section of the state, about 15 km across, is sandwiched between the states of Coahuila and Tamaulipas, and extends to the Río Bravo and the U.S. border. The reason for this particular extension must date back a long time since it is clearly shown on this 1824 map of Mexico. (Note that the shape of the neighboring state of Tamaulipas, with its lengthy extension north-west paralleling the US border, made much more sense in the early nineteenth century before the current international boundary was established). 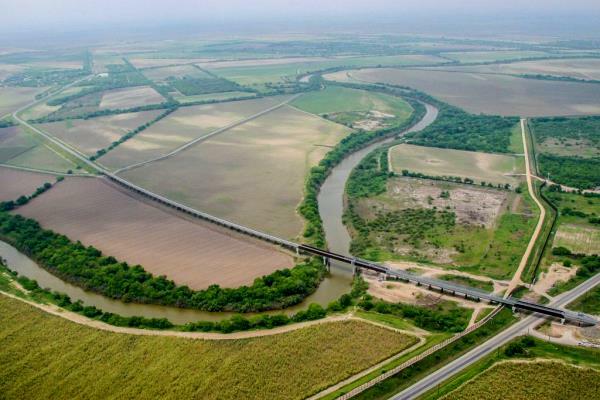 While we’re not sure of the precise timing or reasons for the “neck” of land that gave Nuevo León access to the Río Bravo even before the current international boundary was fixed, it has certainly brought the state some benefit in recent decades in terms of economics and trade. Nuevo León is the smallest of the combined ten “border states” in the USA and Mexico. A closer look at the Google Map image (above) of this area shows the border crossing of Laredo-Colombia across the Solidarity International bridge. Colombia is the name of the small grid-pattern town on the Mexican side, just west of the crossing. Zooming in on the area of the crossing reveals the distinctive street pattern of a major border crossing, with extensive parking and loading areas. The 371-meter-long (1216 ft) bridge has eight lanes for traffic and two walkways for pedestrians. It is one of four vehicular international bridges close to the city of Laredo, Texas. The community of Colombia and the international bridge were built to give Nuevo León its only international “port” for direct trade to and from the USA. 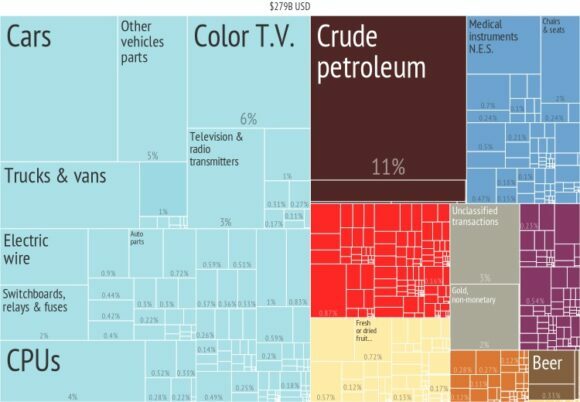 What are Mexico’s leading exports? Which states in Mexico are the most competitive? Other Comments Off on What are Mexico’s leading exports? The table shows the destinations of Mexico’s major export flows, excluding petroleum-related exports, for the first five months of 2014. (All data from Pro-Mexico.) It is no surprise that Mexico’s two main export partners are the USA and Canada, its partners in the North American Free Trade Agreement (NAFTA), but the other countries in the list are far harder to guess, and even most economists would struggle to get them in the right order! Spain, on account of its colonial dominance and shared language, has long been a major destination for Mexican exports, whereas China (#4 on the list) is a recent entry, and one that has risen rapidly in importance for a wide variety of products. The other Asian countries on the list of the top 15 export destinations are Japan, India and South Korea. 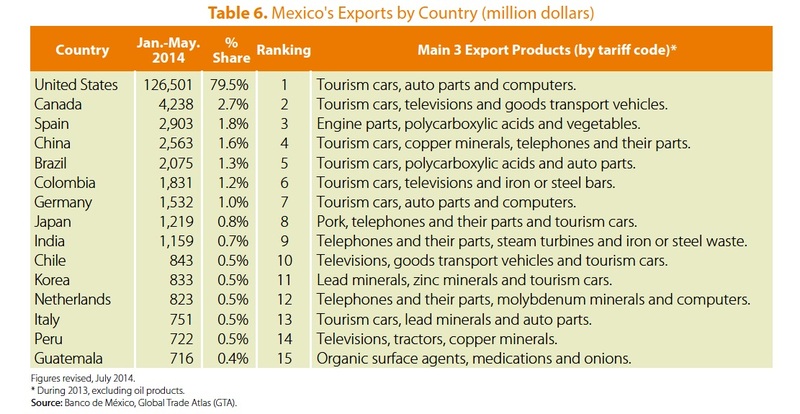 All the remaining top 15 destinations for Mexican exports are in either Europe or Latin America. In terms of the items exported, vehicles of various categories clearly lead the way by a wide margin, while various electrical or electronic items (telephones, televisions, computers) are also important. It appears that Japanese consumers must like Mexican pork, since that is Mexico’s leading export to Japan. And who would have guessed that Mexico also exports significant quantities of iron and steel waste to India, or lead minerals to Italy? For more details of Mexican exports, and a link to an interactive webpage about Mexico’s foreign trade since 1964, see our previous post Trends in Mexico’s foreign trade and Economic Complexity. NAFTA 20 years on: success or failure? Books and resources Comments Off on How does Mexico’s water footprint compare to that of other countries? In a previous post, we saw how Mexico is a major net importer of “virtual” water. 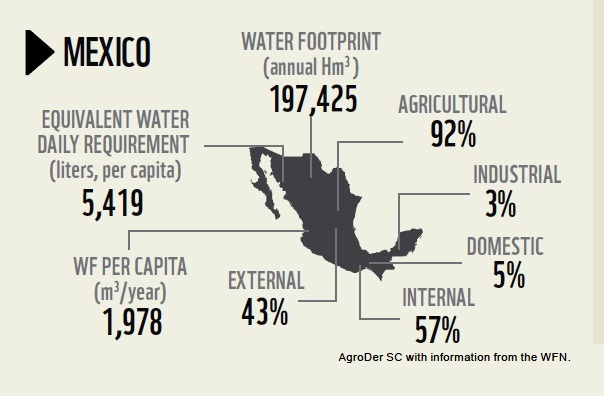 In this post we take a closer look at Mexico’s water footprint. The data throughout this post come from The Water footprint of Mexico in the context of North America (pdf file). From numbers like these, it is possible to calculate the water footprint for an individual consumer in a particular country, and also for an average consumer in each country. How does the water footprint in Mexico compare to other countries? The graphic shows that Mexico’s total water footprint (all consumers) is 197,425 Hm³, of which 92% is agricultural, 3% industrial and 5% domestic. Only 57% of Mexico’s water footprint is internal, the remaining 43% is external (ie water used in other countries to make or produce items imported into Mexico). The average water footprint per person in Mexico comes to 5419 liters/day (or 1978 m³/year). The global average water footprint (all countries, all consumers) in 2010 was 1,385 m³/y. However, some countries have much higher average water footprint/persons than others. For example, the average consumer in the USA has a water footprint of 2,842 m³/y, whereas in China and India the average water footprints are 1,071 and 1,089 m³/y respectively. The water footprint of an average consumer worldwide is primarily determined by their consumption of cereal products (contributes 27% to the average water footprint), followed by meat (22%) and milk products (7%). It should be remembered that countries which heavily rely on foreign water resources may have significant impacts on water consumption and pollution elsewhere. We first discussed the Atlas in 2012 in How “complex” is the Mexican economy?, when we noted that the Atlas ranked Mexico’s Economic Complexity Index (ECI) as #20 of the 128 countries studied. The interactive nature of the online Atlas has added the opportunity to explore many more trends in trade, generating a range of related, visually-appealing infographics. What does Mexico import and export? How has Mexico’s trade evolved over time? What are the drivers of Mexico’s export growth? Which new industries are likely to emerge in Mexico? Which are likely to disappear? What are the GDP growth prospects of Mexico over the next 5-10 years, based on its productive capabilities? It is sometimes hard to imagine just how much Mexico has changed in the past fifty years! Overall, at rank #20, Mexico turns out to have an unusually high Economic Complexity Index given its income level. (All the other countries in the top 20 have significantly higher incomes than Mexico). According to the Atlas, during the rest of this decade Mexico’s GDP should grow relatively rapidly, bringing its GDP rank more in line with its Economic Complexity Index. In general, analyses in the Atlas indicate that during the last few decades countries with higher than expected ECIs compared to their income levels experience more rapid economic growth. Note, though, that while this relationship is empirically true, it does not explicitly include other factors thought to be important to economic growth such as governance and institutional quality, corruption, political stability, measures of human capital and competitiveness indicators. How “complex” is the Mexican economy? The concept of “virtual water” was developed by Professor J.A. Allan of King’s College (London University) and the School of Oriental and African Studies. Allan used it to support his argument that Middle Eastern countries could save their scarce water resources by relying more on food imports. The idea was sufficiently novel for Allan to be awarded the 2008 Stockholm Water Prize. As one example, producing a single kilogram of wheat requires (on average) around 1.5 cubic meters of water, with the precise volume depending on climatic conditions and farming techniques. The amount of water required to grow or make a product is known as the “water footprint” of the product. Hoekstra and Chapagain have defined the virtual-water content of a product, commodity, good or service, as “the volume of freshwater used to produce the product, measured at the place where the product was actually produced”. The virtual water content is the sum of the water used in the various steps of the production chain. While the idea of virtual water has attracted some attention, its methodology is contested, and its quantification is not yet sufficiently precise to offer much potential for policy decisions. 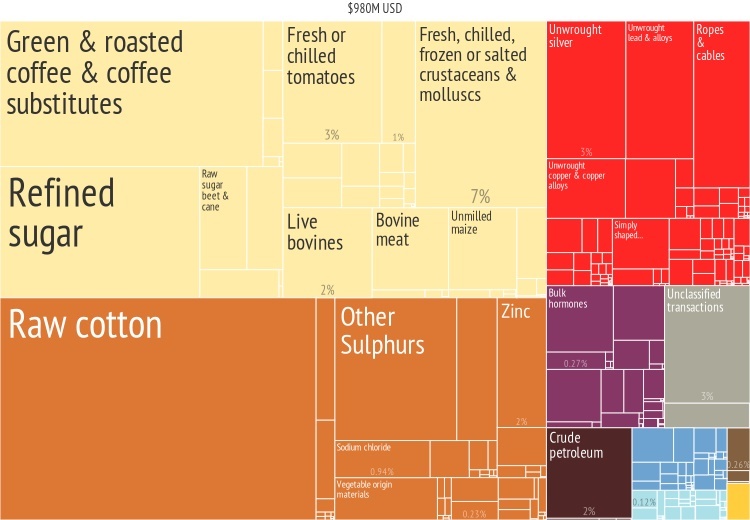 Imports and exports of virtual water represent the “hidden” flows of water involved when food and other commodities are traded from one place to another. 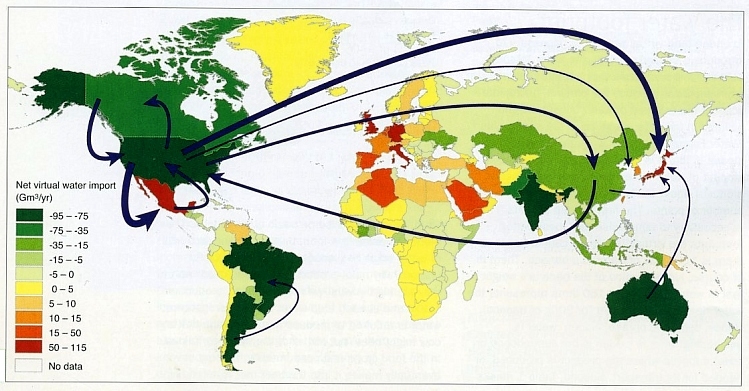 The map below (from Hoekstra and Mekonnen, 2012) shows the net imports (imports minus exports) of virtual water for different countries for the decade 1996-2005. Note that only the major flows are shown. In North America, both the USA and Canada have a significant positive virtual water balance (i.e. they are major exporters of virtual water), whereas Mexico has a significant negative water balance, and is clearly one of the world’s largest importers of virtual water. As Allan’s original work suggests, this is not necessarily bad news since it may imply that Mexico is currently using less of its own (limited) water resources than it might otherwise have to. In other words, Mexico’s virtual water imports may be delaying the inevitable crunch time when water usage becomes a critical limiting factor in the nation’s development. A.Y. Hoekstra and M.M. Mekonnen. 2012. The water footprint of humanity. Proc. Nat. Academy of Sciences, 109, 3232-7. Map was reproduced in “Spotlight on virtual water” by Stuart N. Lane in Geography, vol 99-1, Spring 2014, 51-3. This engaging book analyses the historical geography of the port of San Blas, on Mexico’s west coast, and its hinterland which includes the small city of Tepic, the state capital of Nayarit. This area held immense importance during colonial times, was one of the main gateways for trade and influence peddling during the nineteenth century, before lapsing into relative obscurity at the end of the that century, and into the twentieth century. The tourism industry has sparked a mini-revival but none of the many grandiose plans for this coast have even been brought fully to fruition. The Camino Real in Richter’s title is actually a branch from the Camino Real de Tierra Adentro (The Inland Royal Road, the spine of the colonial road system in New Spain). During colonial times, this linked the inland city of Guadalajara to Tepic and thence San Blas, though the modern highways uniting these places no longer follow the same route. Robert Richter has known this area personally for decades, and his intimate knowledge of the local geography shines through. The book combines his own personal experiences with intensive historical research, both in the library and on the ground. Richter’s objective is to pin down the precise route of the Camino Real, and then find every remaining vestige of it that he can on the ground. 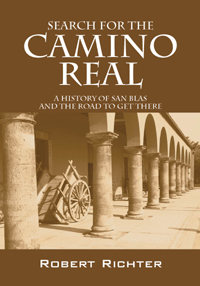 In reading the story of San Blas and the Camino Real, readers are treated to a dazzling array of insights into what made this area tick for so long before subsiding into something of a backwater. This branch of the Camino Real, from Guadalajara to San Blas, played a key role in the history of Western Mexico, and saw everything from pirates and adventurers to soldiers, priests and smugglers. Richter tells his story with passion and it is impossible not to be drawn into the narrative and share his excitement as he sets out to find “missing” sections of the Camino Real, accompanied by a motley crew of secondary characters. To what extend does he succeed? Sorry, no spoilers here! Inevitably, the past merges with the present and the future. What began as a seemingly straightforward historical geography becomes at turns a travelogue, journal of fieldwork and short essay about the sustainability of economic development along this coast. Richter is clearly not against change, but argues strongly that local tourist development in the future must take account and respect the region’s ecology, its history and its culture. This book should be of interest to geographers everywhere. It serves to prove that historical geography need not be dull and stuffy but can be made relevant, exciting and even entertaining, at the same time as it offers us valuable insights into possible futures. One minor plea: please add an index when the second edition of this book is prepared! “Search for the Camino Real, a history of San Bad and the road to get there” is one of several books by Richter centered on the fading coastal village culture of Nayarit and the Mexican Riviera. His adventure novel, “Something like a Dream” (Oak Tree Press, 2014) is an especially entertaining read, with a lively plot and well-described settings ranging from the tourist resort of Puerto Vallarta to Nayarit fishing villages and tiny Huichol Indian settlements high in the Western Sierra Madre. Map of the beaches of Colima, Jalisco and Nayarit, Mexico shows the location of all the key places mentioned in Richter’s books. Bananas are the world’s fourth most important dietary staple after rice, wheat and corn (maize). They are a major source of nutrition (low in fat, but rich in potassium and vitamins A, B, C and G) for people living in tropical areas. Of the 80 million tons of bananas produced globally each year, less than 20% enters international trade; the remainder is eaten locally. Bananas that are ripe and eaten raw are called desert bananas; those that are cooked are called plantains. India is the world’s largest banana producer (31% of the world total) but is not an important exporter. Other leading producers include China (10%) and the Philippines (9%). Mexico (2%) is the world’s tenth largest producer, and the world’s 13th largest exporter. The world’s leading exporters of bananas (in dollar terms) are Ecuador, Costa Rica, Colombia and the Philippines. How did bananas reach Mexico? The banana plant is thought to have originated in southern Asia, possibly in the Mekong Delta area. Though the details are sketchy, banana plants were carried from there to Indonesia, Borneo, Philippines and Pacific Islands, including Hawaii. By AD650, bananas had reached Egypt and the Mediterranean coast. In the fiteenth century, Portuguese navigators and slave traders carried bananas to the Canary Islands. By the early sixteenth century, bananas had been introduced by Spanish missionaries to Santo Domingo on the island of Hispaniola in the “New World”. Bananas reached Mexico for the first time in 1554 when Bishop Vasco de Quiroga (the first Bishop of Michoacán), returning from Europe, brought some plants back with him from his short layover in Santo Domingo. FAO statistics for the past few years show that Mexico has about 75,000 ha planted with bananas. Total production is close to 2.2 million metric tons a year, giving an average yield of about 30 metric tons/ha. The yield is trending slowly upwards. The yield under irrigation (38.3 tons/ha) is 55% higher than that from rainfed farms. As a result, while irrigated farms account for just under 40% of the total acreage of bananas, they supply 50% of total production. Commercial banana growing provides about 100,000 direct jobs in Mexico and 150,000 indirect jobs. Tabasco (25%), where average price per metric ton is lower. Mexico’s largest banana exporting company, San Carlos Tropical Exports, is based in Tabasco. Bananas are also grown, on a smaller scale, in Jalisco (4.5%), Guerrero and Oaxaca (3% each) and Nayarit (2%). Maps showing banana cultivation areas in individual states can be generated via SIAP, the Agriculture Secretariat’s online database system. The world’s major importers are the USA (bananas are the single most widely eaten fruit in that country), Germany, Japan, Russia, UK, Italy, France, Sweden and China. Bananas were first introduced into US diets (from Cuba) in the early 19th century. The earliest large-scale shipments of bananas to the USA were from Jamaica in the 1870s, and were organized by Lorenzo Dow Baker, who later founded the Boston Fruit Company, which later became the United Fruit Company, now Chiquita Brands International. Banana exports from Mexico have risen rapidly in recent years and reached 307,000 metric tons in 2012 (compared to 60,000 tons in 2005), worth about 140 million dollars. The USA is the world’s largest importer of bananas and Mexico’s main foreign market, receiving 80% of all exports of Mexican bananas. 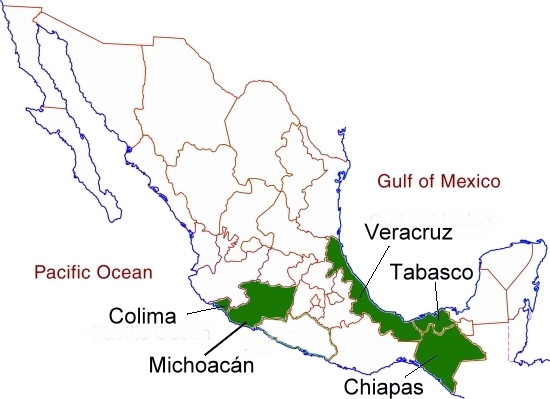 The geography of tequila: where is tequila made? More than a year ago, the World Trade Organization (WTO) sided with Mexico and appeared to finally bring to an end a long-running dispute between Mexico and the USA over “dolphin-safe” tuna. The WTO decision confirmed that the methods used by Mexico’s tuna fishing fleet met the highest international standards, not only for protecting dolphins but also for conserving other marine species. The USA has now responded by strengthening the rules governing the use of “dolphin safe”, a label first established in 1990. According to Mexican officials, the changes effectively circumvent the WTO decision by establishing two distinct regulatory regimes, one for the Tropical Eastern Pacific Ocean area (where the Mexican tuna fleet operates) and another, much less restrictive, for all other regions. Mexican officials argue that the second regime, which does not include independent observers, has been unilaterally established by the USA in order to protect its own tuna fleet which uses methods that are not environmentally sound. Part of the conflict over “dolphin safe” tuna revolved around the very different methods of fishing employed in the two countries. Mexican tuna fishermen use the encirclement method which involves locating tuna by chasing dolphins that swim with the tuna schools. Large purse seine nets are then employed to scoop up the fish. Decades ago, this method did indeed result in many dolphins being caught as bycatch. This led to justifiable outrage from environmentalists and the “dolphin safe” system. It quickly led to Mexico’s fleets employing specially-adapted nets and changes in procedure to ensure that any dolphins accidentally trapped can escape or are released and returned (alive) back to the ocean. According to the best available data, these improvements quickly reduced dolphin bycatch to close to zero. Most US tuna fishermen, on the other hand, rely on either long-line fishing, in which every species hooked is killed, or employ fish aggregating devices to encourage the tuna to school. Both methods used by US tuna fisherman kill many immature tuna as well as numerous other species, including sharks and marine turtles (especially the critically endangered Pacific leatherback turtles), as well as seabirds (especially albatrosses and petrels). The WTO agrees with Mexico that the method used by its tuna fleet is the most sustainable of those permitted by the International Dolphin Protection Program, and protects not only dolphins but also avoids the bycatch of juvenile tuna, ensuring the long-term viability of the tuna fishing industry. The WTO resolution appeared to finally end this acrimonious dispute which had begun thirty years ago and included a US embargo against Mexican tuna which lasted for more than a decade. It meant that Mexico’s tuna fishermen could legally stamp “dolphin-safe” on their exports to the USA, the world’s largest tuna importer, certifying that the tuna had been caught in full compliance with the International Dolphin Protection Program. The revised US rules mean that most Mexican-caught tuna will still not qualify for the “dolphin safe” label. Mexico’s tuna catch (mainly yellowfin tuna) peaked at 166,000 tons in 2003 when more than 20,000 tons were exported, mainly to Spain, and has since declined to around 115,000 tons. About 20,000 families in Mexico depend on tuna fishing for their livelihood. This figure includes not only fishermen but also those working in associated processing and packing plants. Mexico’s 130-vessel tuna fleet is the largest in Latin America. The USA-Mexico tuna war is a classic example of a cross-border fishing/trade dispute. The new US regulations mean that the ball is now firmly back in Mexico’s court. Mexican fishing officials were quick to criticize the new rules, but have not yet announced their next move in this long-running saga which looks set to rumble on for quite some time. How sustainable is commercial fishing in northwest Mexico? Which company exports the most motor vehicles in Mexico? In term of units exported, Ford was the leader with 449,925 units. Ford exported over 97% of the vehicles it made in Mexico in 2011. Though Ford sold many new cars in Mexico, virtually all were imports, mainly from the USA or Canada. GM was a relatively close second with 443,237 vehicles exported, 81% of the total produced. VW was next with 439,925 units exported, 84% of their total. Nissan was fourth with 411,660 vehicles exported which was a significantly lower percentage (68%) of its total production. Nissan sells about a third of its Mexican produced vehicles in Mexico, by far the highest percentage among auto manufacturers in Mexico. Chrysler/Fiat exported 266,117 vehicles, 79% of their total production. Toyota was next with 49,549 vehicles exported for an amazing 99.9% of the total manufactured. Surprisingly only 47 of the almost 50,000 Toyotas made in Mexico in 2011 were sold in Mexico; all of the rest were exported to the USA or Canada. Virtually all of the thousands of new Toyotas sold in Mexico are imported. This is a very extreme case of globalization at work under NAFTA. Honda exported 36,429 units in 2011 for 80% of its total production. Data are not yet available to determine which companies will lead in exports in 2012 and the percentage of total production that is exported. Overall production is expected to rise by over 20% in 2012 and perhaps even faster in future years judging by the amount auto companies are currently investing in Mexico. Obviously, production levels in 2013 and beyond will be closely tied to demand in the USA and Canada.